Drawing is a fun and interactive activity to pursue. Most people have done a little drawing or at least some doodling at some point in their lives. Offer clients the opportunity to revisit drawing as a pastime. Exercising the creative mind increases brain activity and promotes wellbeing. 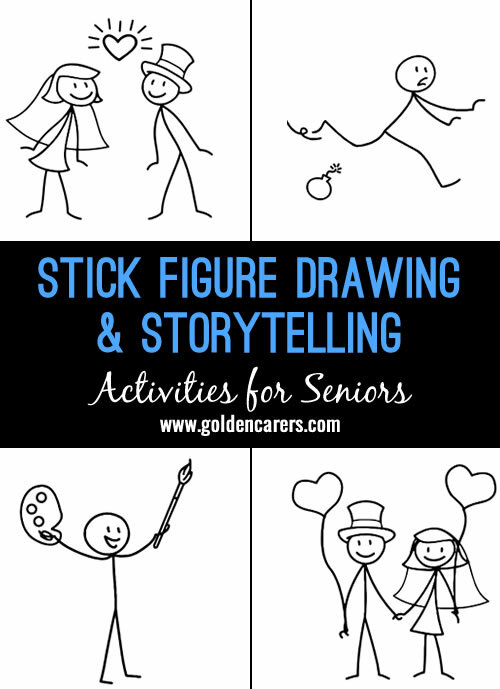 Stick figures are downright easy to draw and amazing stories can be told with these crude and cute stick figures. Anyone can draw stick figures; all you need is a circle and five straight lines. No hair, clothes, or features are necessary; just simple figures telling a little story. Drawing is an activity very relevant to clients with dementia. It can stimulate and bring to the surface many emotions that will improve overall wellbeing. Facilitators should join participants and invite other staff and visitors to join in the session. Focus on storytelling rather than making a ‘nice drawing’. Encourage clients to think of a stick figure ‘doing’ something: playing, laughing, exercising, fighting, courting, eating, walking in the rain, running away from a tiger or a policeman. Moving gestures make stories better understood. They may use a line or two of text as an option after gaining confidence. There is no ‘right way’ to draw a stick figure. Unlike other types of drawings, many clients on seeing the stick figure examples may surprise you by saying “I can do that” and they are right; this will lead to a great deal of satisfaction. They will take a minute or two to get the dimensions of the human/animal bodies right. With a little practice they will get better and better. Aim for a pleasant and relaxed atmosphere. Download and laminate examples and leave them on the table so participants can look at them whenever they want to. Praise participants and laminate the drawings to be pinned on their bedroom walls if they so wish.